OK then; so if the Left Hander Club survey data have to relent at last to the null hypothesis – that left-hander births accumulate in their own time, owing no statistical fealty to the months in which they come to term. But if that be so, it might then behoove us to ask about alternative data sets which might enable us to pose the birth month/handedness question anew. And the data are large, if not big; close to 18,000 player names and cells packed with the biographical bits a baseball fan hankers for, among these player height, weight, birthplace, and birth month, and two handedness fields – one for the players’ batting orientation, the other for the hand with which they threw, or throw, a ball. The Lahman population, of course, is exceedingly specialized, and as such is assuredly skewed. For one thing, all its members are male, a gender constant which in fact probably serves the data well, given our intentions for them. And names here are most obviously not self-selected; neither Sean Lahman nor the players themselves had the minutest foreknowledge about the research interest that brought us to them. Now there’s that multiple-handedness-fields matter to which I pointed a paragraph ago. The data record what I’m calling the players’ batting orientation in one of the fields, and their throwing hand in the other, and it is throwing that stands as the more primeval or “natural” proclivity. 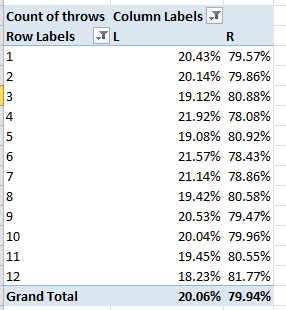 In fact 6.6% of the players for whom the data are available have received the code B in the Bats field, that letter standing for a player who can hit either right or left-handedly, depending in turn on the throwing hand of the pitcher whom they’re currently facing (I’ll short-shrift the technicalities, but it’s easier for a left-handed hitter to contend with a right-handed pitcher and vice versa). It’s clear that these players – known in the trade as switch-hitters – have tutored themselves into this duality, but I can’t think of any player who has wilfully re-schooled his throwing orientation. Hence, I’d work with the throwing hand data. But again, let’s not take our eye off the ball. We’re looking toward the Lahman list in order to learn something about handedness and its affinities – if any – with birth month, and it appears to me that its entries, in virtue of their number and the unawareness of its population of our plans for the data – better suits them to the task than those of the Left Handers Club survey. So let’s look. And another skew issue implores our attention here. If lefthanders amount to about 10% of the general American population (although ballplayers in the US are increasingly foreigh-born) it’s clear that major-league baseball players, on the other hand (felicitous bit of word play there), are about twice as left-inclined as everyone else. But again, that tilt, incontestable as it is, isn’t quite the issue. Our concern, again, is with inter-month percentages; and the player numbers above, quite apart from their departure from nationwide percentages, don’t appear to rise to the standard levels of significance. That is, we seem to have come face-to-face with the null hypothesis again – and we’ve blinked. The overrepresentation of lefthanders here seems to be due to the belief – not entirely groundless – that lefthanded hitters are advantaged, in view of the preponderance of right-handed pitchers in the game (though that edge appears to be blunting; see this citation in the Wall Street Journal of my little study of the left-right batter data). But that is a recruitment issue, one that speaks not at all to the birth-month question. 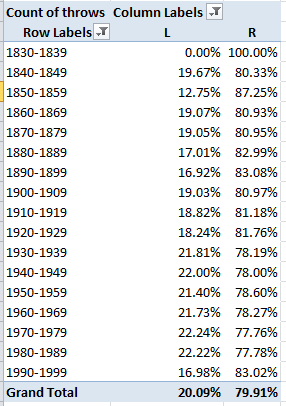 Again, the fairly dogged ascending slope in lefthander percentages owes its shape to influences other than birth month (the apparent fall-back in the 1990-1999 lefthanded numbers may be nothing but an artifact of the smallness of its bin – 106 names). So if you ask me – though I can’t recall that you did – birth months and left-handedness have next to nothing in common. And I’ll dare to say the same about birth months and right-handedness.